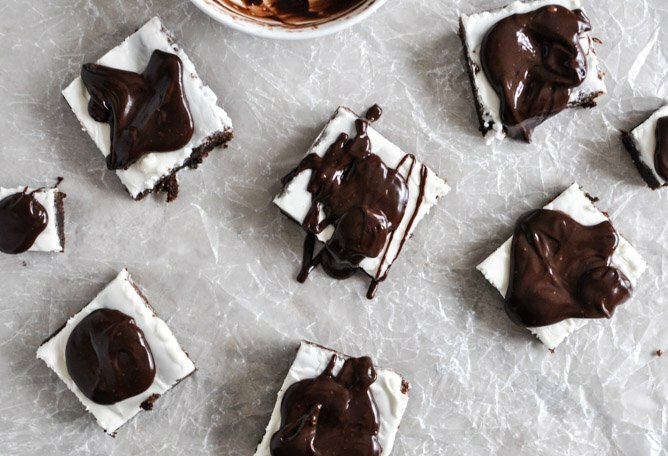 There’s something important that you should know about these brownies. And it’s that I got to keep them all to myself. See, I married this guy who doesn’t like chocolate and mint together. What? I know. That’s what I said too. He also isn’t *thrilled* about chocolate and peanut butter when combined but we are learning to overcome such a disturbance. I mean, that’s like total grounds for divorce. The thing is, I don’t even think I KNEW about the mint + chocolate combo hatred until after we were married. Maybe he mentioned it once but it seems that I may have what some call selective hearing. Whatever. That just certainly sounds like “irreconcilable differences” to these ears. Me? I love chocolate and mint together. It’s so fresh… so cooling… so perfect! I actually find it to be refreshing, which shouldn’t come as a surprise since it’s basically dessert. Only I would find a non-fruit, chocolate-loaded dessert refreshing. Hey, at least you always know what you get here. 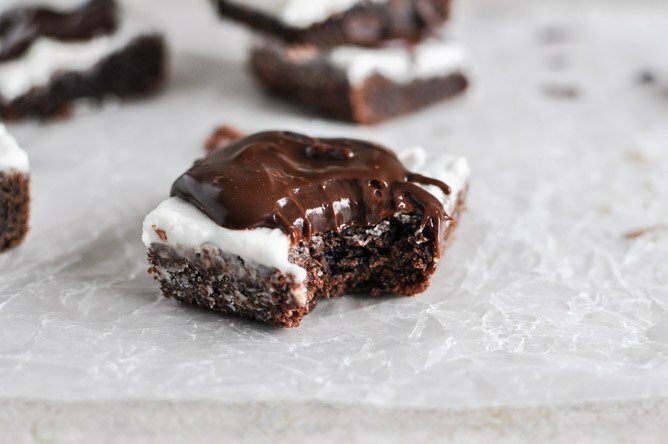 So… I’ve been dying to make a peppermint pattie brownie for months. Maybe even over a year? 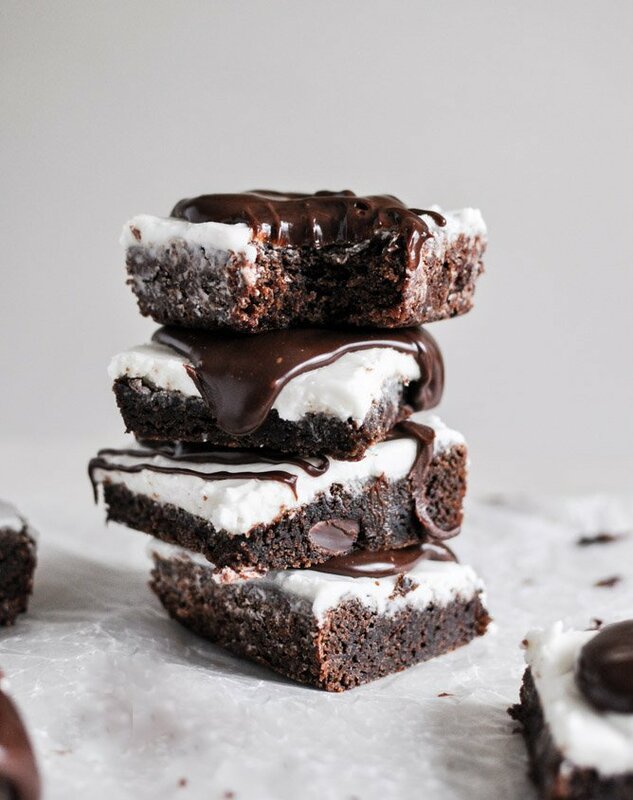 Ever since I made these 1988 brownies, which um… don’t even compare here. 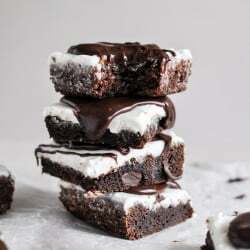 I didn’t want to just stuff plain brownies with the traditional old things, I wanted to create the cooling, tingling center of a York peppermint pattie and layer it into a brownie. A few years ago I made homemade peppermint patties and holy cow were they fab. Love them so much. I took the filling and combined it with an 8×8 pan brownie recipe, then covered the whole thing in ganache. And it’s not like I covered it neatly. I can’t be bothered with such patience. Slap that chocolate on there and feed me. Preheat oven to 350 degrees F. Grease an 8×8 baking pan with butter or nonstick spray. In a large bowl, combine melted butter with sugar and vanilla extract, whisking until combined and almost smooth. Whisk in each egg one at a time, stirring until a smooth batter forms. Add in flour, cocoa powder, baking soda and salt, stirring until combined. Fold in chocolate chips. Spread batter in the 8×8 baking dish and bake for 25-30 minutes until set. Remove and let cool. While brownies are cooling, add powdered sugar, butter, milk, vegetable oil, vanilla and peppermint extracts to the bowl of an electric mixer. Beat until smooth and creamy. 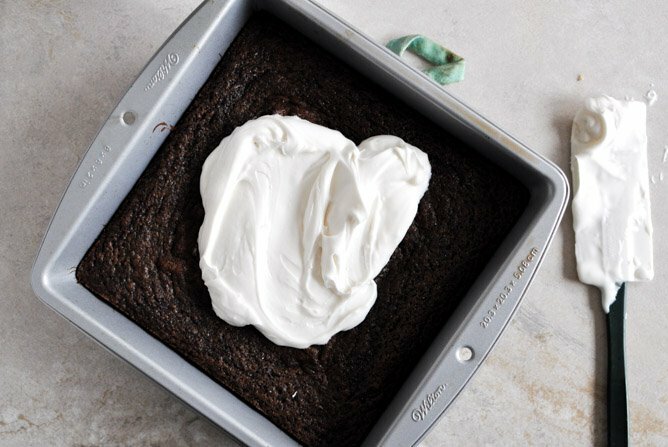 Pour over brownies and spread in an even layer with a spoon or spatula. Place in the refrigerator until set, about 30 minutes. To make ganache, heat heavy cream until warm and pour it over chopped chocolate. Stir for a few minutes until totally combined, smooth and creamy. Spread over the top of the peppermint layer or cut brownies first and spoon over top. I love these refrigerated! Buttermilk Bacon Blue Smashed Potatoes. What is the benefit of using evaporated milk rather than regular milk or cream? Is it really necessary for the texture in some way? I’d hate to buy a can for such a small amount and throw the rest away. Jessica – would these taste just as good if you didn’t add the mint extract (don’t like mint)? 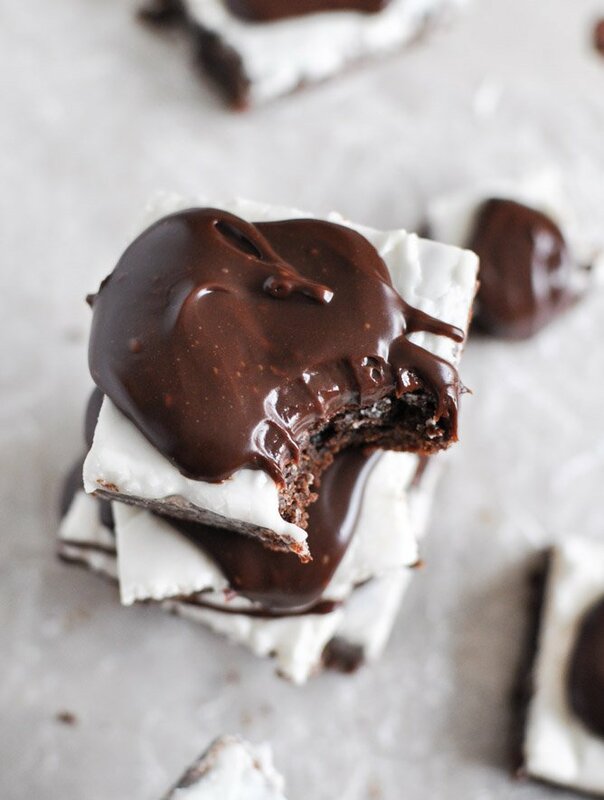 not sure i’d made this recipe if you don’t like mint – i think the middle layer would just be off without the mint flavor? Lynda, I just tried making these, and the mint doesn’t seem really powerful. The next time I make them, I’ll add a touch more peppermint. But since you’re not fond of mint, why not try some orange extract, or maybe raspberry? How about hazelnut? Any flavor that goes well with chocolate, just pick one. Pingback: Kaleidoscope : Simple & Tasty Holiday Desserts! Finally made these for Christmas after having it saved for years. I wish I didn’t wait so long! They were a huge hit. Thanks for the great recipes! Hey Jessica! I have been a longtime reader and finally made these for the first time. PERFECTION! I don’t know how you replicated the peppermint pattie so perfectly for this icing/topping but I love it. Thank you so much for sharing!